This is the Friday edition of ‘Sports This Morning’ on your award winning Channels Television. Yemi Adebayo takes us on a trip starting with top stories in the world of sports. 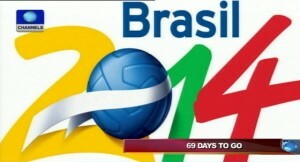 The countdown to FIFA World Cup, Brazil 2014 continues with 69 days to the biggest football event on the planet; we look at the readiness of Brazil to host the world and also focus one of the teams that the world would be expecting to make clear statements at the tournament, the Azzurri. Meanwhile, the question on everybody’s lips is who wins the Women’s FIFA U-17 World Cup? Is it going to be Japan or Spain? You may have found out the winner but the analysis on this edition of the show would be a delight. In the Nigerian Glo Premier League, the League Management Company has granted Nembe City FC provisional admission into the league after the club met conditions set by the body. We also bring you some analysis of the great boxing match-up that promises to be a classic. Timothy Bradley says he is ready to prove doubters wrong by beating Filipino boxer Manny Pacquaio in their scheduled rematch. Let’s also take you to South America, Argentina to be precise, as Boca Juniors takes on River Plate.